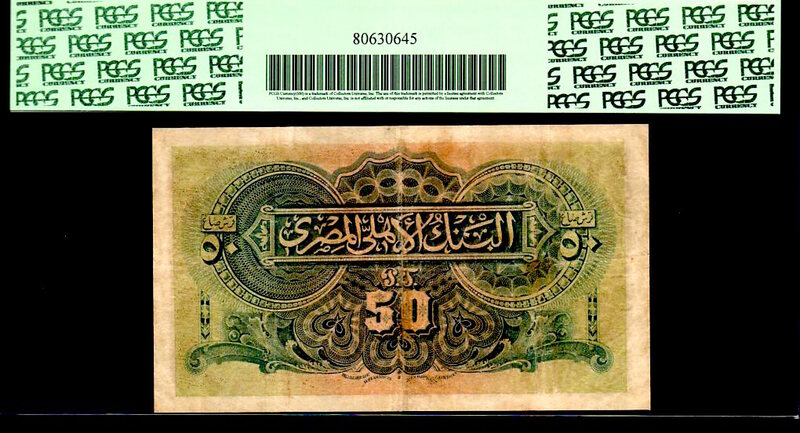 EGYPT P11 12.9.1915 50 PIASTRES "SPHINX" built by " THE PHAROH KHAFRE" PCGS 15 ! 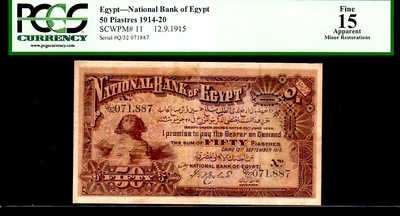 EXTREMELY RARE, AS ALL EARLY EGYPT NOTES ARE, THIS PIECE CARRIES WITH IT "TOTAL ORIGINALITY" 100%! NO, NO, NO GRAFFITI NOW OR EVER ON THIS PIECE. THIS NOTE HAS NOT BEEN PRESSED OR ANY OTHER PROCESS - TOTALLY ORIGINAL! WE ALSO HAVE A P11 DATED 1917 AND HAVE WORKED VERY HARD TO PROCURE BOTH PIECES (1916 CAME TO US DIRECTLY OUT OF EGYPT AND THE 1917 WAS FOUND HERE BY SOMEONE WHO GOES THERE AND DIGS UP OLD TREASURES LIKE THESE. TRULY A RARE OPPORTUNITY! EGYPT P11 12.9.1915 50 PIASTRES "SPHINX" built by " THE PHAROH KHAFRE" PCGS 15 ! 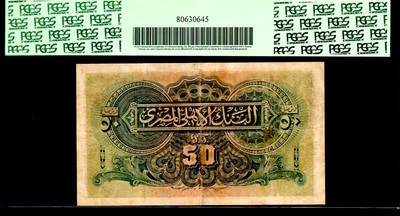 EXTREMELY RARE, AS ALL EARLY EGYPT NOTES ARE, THIS PIECE CARRIES WITH IT "TOTAL ORIGINALITY" 100%! NO, NO, NO GRAFFITI NOW OR EVER ON THIS PIECE. THIS NOTE HAS NOT BEEN PRESSED OR ANY OTHER PROCESS - TOTALLY ORIGINAL! WE ALSO HAVE A P11 DATED 1917 AND HAVE WORKED VERY HARD TO PROCURE BOTH PIECES (1916 CAME TO US DIRECTLY OUT OF EGYPT AND THE 1917 WAS FOUND HERE BY SOMEONE WHO GOES THERE AND DIGS UP OLD TREASURES LIKE THESE. TRULY A RARE OPPORTUNITY! ?